HINIC, Nikola Peacefully on February 7, 2018 at St. Joseph's Hospital in his 66th year, surrounded by his loving family. Cherished husband of Ranka for 43 years. Beloved father of Mira Hinic, Dejan Hinic and his wife Lisa. Loving Dedo of Alexia and Luka. Survived by his mother Bozidarka, sister Mira Koviljcic (Slobodan), Milena Rkman (Stojan), Dusan Hinic (Nedeljka), and the late Djoko Hinic. Nikola will be greatly missed by the Marijan family, Jurkovic family, Marinic family, Kumovi, nieces and nephews and many other family and friends in Canada and abroad. Special thank you to the doctors and nursing staff at St. Joseph's Hospital, and to Dr. Gangji and Dr. Treleaven for all of their compassion and support. 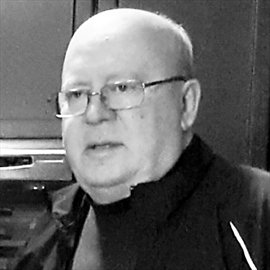 Friends will be received at the DONALD V. BROWN FUNERAL HOME , 36 Lake Avenue Drive, Stoney Creek, on Thursday from 2-4 and 7-9 p.m. Pomen at 7:30 p.m. Funeral Service to be held at St. Nicholas Serbian Orthodox Church, 1401 Barton Street East, on Friday, February 9, 2018 at 11 a.m. with The Very Reverend Father Vojislav Pavlovic officiating. Interment to follow at Mountview Gardens Cemetery, Stoney Creek. Online condolences may be left at www.donaldvbrown.ca.